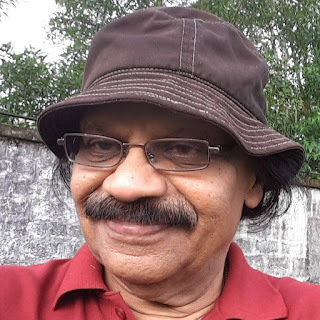 TVG Menon, alias ‘kar2nist’, is a freelance cartoonist. His hobbies include, among other things, painting, computer graphics, and drawing cartoons, both technical and social. He holds a B.Sc. Degree in Physics as also a degree in Electrical Engineering from the University of Delhi. During his active working days he has been contributing cartoons from 1980 onwards for the house magazines of his Indian companies His works have also appeared in the house magazine of his UK Company . He has been participating in many world cartoon contests and exhibitions for the last few years. His works have appeared in the associated traveling exhibitions in France, Croatia and Portugal. Romanian Cartoon Association has also hosted a full web page of his caricatures of famous Romanian personalities in their website. He has exhibited some 400 plus cartoons in his gallery at Toonpool.com. Also he has been contributing to a Spanish on-line Cartoon Magazine named “Bostoons Themag”.As well as Fenamizah , to mention a few. A retired technocrat, Mr.Menon presently leads a quiet life with his wife in Kochi, in the southern State of Kerala, India.